After watching Sensei Price at the KUGB Nationals for a few years the thing I remember the most in fact was this menacing mohican style haircut and goatee beard. Add this to a bloke that seemed to destroy opponents for fun and the making of a champion was plain for all to see. Back then I was in a younger age category, which to this day I’m pretty thankful for! After hearing of Sensei’s visit to Coseley hosted by Tipton SKC, I knew that this was an opportunity I couldn’t pass up. I confirmed my attendance and greatly anticipated the date to arrive. Apart from a couple of brief facebook chats and some kindly donated uploads for the site, I’d never actually spoken to Sensei in real life. The days drew nearer and I started to ponder over what Sensei would be like as a person, what the training would entail and if he was as scary as I remembered all those years ago. Back then watching Sensei at the nationals with that mohican, goatee beard and demonic eyes; it seriously brought a sense of fear. Obviously I was just a kid back then, but the thoughts have remained to this day. I can only think of one reoccurring karate event in my life that has brought the same kind of fear to me and that involved the Thursday night Cocksmoor Woods training lineups of around 15 blackbelts. These guys would be baying for blood, any one attack and believe me these guys were seriously out to get you. Not only did it push you to the very edge of your physical fitness, but also it would mentally beat you to within an inch of your existence. Absolutely knackered at the end after being swept left right and centre; you’d have the “privilege” of facing Greg Hegarty and Ronnie Christopher just to finish you off for good measure (before doing it all over again!) Now I’m not complaining, it’s training like this which helps to determine your mental character and proud that I was studying karate at a time where this was more acceptable with less worry of all the health and safety rules that are in place today. After jumping on the train with postcode set on Google Maps, I arrived at 12:30 in preparation. I was warmly greeted by the instructors of Tipton Shotokan Karate Club and given a tour of the facilities. After quickly setting up the camcorder I got changed and began to warm up. Slowly but surely, others began to arrive and all stretched off getting ready to start the 3 hour session. I’d turned up on my own not knowing anybody there and pretty much kept myself to myself. As more and more karateka arrived, I started to recognise a few faces from the Kizuna World Championships that I’d taken part in back in May, which was nice to see. A fellow karateka approached me before the beginning of the session and introduced himself as Barry, a member of the Tipton Karate Club. He said he’d seen that I was on my own and thought he’d say hello. He might not realise it, but that was to me personally a really nice thing. It epitomized the essence of a true karateka showing a sense of care and a thought for others. Sensei Price arrived not long after and after a slightly nervous wait we lined up, 35 participants strong originating from both Shotokan and Shukokai styles. And so it began! 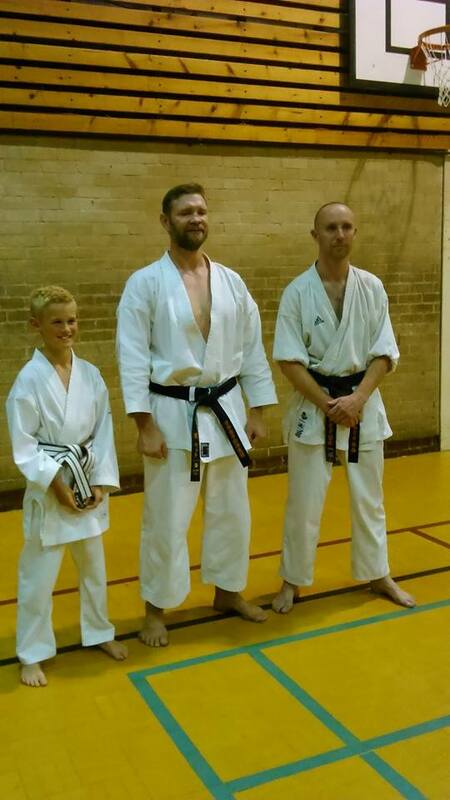 Any apprehension or nerves previously running through my mind were soon blown away as Matt Price Sensei actually turned out to be not just a genuinely nice bloke, but a bit of a comedian! The 3 hour class was broken in to 3 hourly sections incorporating kihon, followed by kata then lastly some kumite techniques. Now there was one main factor that I realised after the lesson that cropped up in the kihon section. No matter how simple the technique is (or appears to be); with a lack of concentration it can seriously go belly up! Here we had what you would presume as some relatively simple combinations being taught in the kihon section. This drill incorporated gedan barai in kiba-dachi, then in to shutouke and gyakuzuki reverse punch. Three simple forward steps then going backwards utilising good preparation at the halfway point and same leg leading both forwards and back. Simple yes? Well, it should have been, but for some reason there was a bit of struggling at the beginning and by more than one of us! At the end of the drill everybody was pretty comfortable with it, but it served as a gentle reminder that even the most fundamental steps learnt from the beginning of karate can get a little muddled to say the least and re-emphasized the importance of practicing different Kihon combinations to get the mind warmed up. Without strong kihon, what can we expect our kata or kumite to be like? Sensei Price moved on and demonstrated through various techniques the need for utilising the hips, transferring the body weight and the art of relaxation in order to focus the transfer of energy from one technique to the next. Now I’m not an expert on it, but it was a reassuring feeling that the lessons he was teaching us were being taught week in week out at my local Ruach Karate club under Gary Beggan Sensei. During a reverse leg maegeri, step back gyaku tsuki, I felt comfortable and relaxed in the technique and this aided speed and strength from a good hip rotation. With this relaxation and good hip rotation in mind it was time to partner up. Barry who’d introduced himself to me before the seminar partnered myself and we looked at a gyaku tsuki punch with the other side being a target. The purpose was to use the hips, but ensure that the punch was maximising complete transfer through the body core so as to not lose strength (all whilst remaining relaxed). Sensei Price gave us some free range and basically gave us the all clear to put some power in to it. I must say, you don’t have to ask me twice! Having the opportunity of using a little force with your partner in a controlled setting personally serves me two purposes. 1, Are my attacks strong enough to hold their own in a real life situation? And 2, Can I take the punch to the stomach that I’m about to receive? When focusing on kata; Sensei pondered what to look at and decided upon a kata that almost nobody knew. A good way to put us all on the same playing field! The kata entitled Junro Shodan is one of 5 additional katas created by the late Asai sensei, founder of the JKS. According to York Karate Website (opens in new window), Asai Sensei “believed that there were gaps in the original 26 Shotokan kata and so filled those gaps with the Junro series. The Junro series also helps to prepare the student for the more advanced Shotokan kata that follow the earlier ones. The Junro kata are assessed at Shodan level and beyond.” Now we went through this kata fast! It was originally broken down in to sections before adding the extra parts to the original section learnt. It’s amazing when you think you’ve learnt the first part to only find how quickly it evades you when you comprehend the task of putting it all together! Needless to say we had a go and it was interesting to see a new kata that to me at least was unheard of in my karate education. Below you can see what it “should have looked like.” Our variation on the other hand was a little different to say the least! The course inevitably drew to a close and the time flew by extremely fast. Given half a chance I’d have probably done another 3 hours on top. Saying that I should probably be careful for what I wish for as I might be seen as not having worked hard enough in the first 3 hours! Sensei Price finished off with a question and answer session and participants were eager to know in particular about mentality towards competition, training regimes and lifestyle exercises and diet to peak them in preparation. The final question particularly stuck with me, “How do you set aside doubt in competition?” The answer will not only help me personally, but also made me laugh. The response? When I think about all we went through during the seminar in addition to the time Sensei took with us to answer questions (not to mention his time for autographs and photos), I cannot praise him enough. Sensei was a funny, down to Earth guy and in particular he was approachable. So on Sunday 3rd August I could have gone down the pub and had 4 pints. I didn’t. What did I get instead? 3 hours with a world champion, extra karate knowledge that will stay with me forever, a chance to meet a personal hero and dozens of new friends that I look forward to seeing again. Would I swap it for a trip to the local? Nah!